Why is Whack-a-Mole so popular in Japanese games? Yes, today we’ll be grousing to a copious amount about having to play a Whack-a-Mole variation in Super Mario RPG, but first we get to talk about exercise! Because...exercise! Riding the exercise bike isn’t terribly exciting, nor is it terribly hard. It just is. It is a physical thing I can do while playing to justify playing. The weather in Portland has also been unreasonably hot, making everything more taxing. My energy is sapped, my enthusiasm is crushed, and the AC is running nearly 24/7. I decided to ride while having the AC pointed directly at me the whole time, which gave me a strange sort of result. Namely, I didn’t really sweat or feel like I was getting much from the exercise at all. I have no idea how physical activity works, but the AC took from me the only indication that anything had worked: sweat. From now on, I’ll be sticking to the uncooled workout (until I get sick of the heat and go back to the AC). In the game, Mario, Mallow, and new party member Geno head to the Pipe Vault, which is an entirely optional level, though you might not realize that immediately. In fact, going directly to Moleville right away doesn’t really rob you of anything other than a weird little detour to Yo’ster Isle. But we like detours in my house, so into the pipes! The enemies aren’t much to write home about, with Piranha Plants making an appearance here and popping out of pipes, as you’d expect. Since this is the Pipe Vault, you’ll be dealing with pipes that lead you around the area, some to secrets and some to nothing in particular. And one pipe leads you to--sigh--Whack-a-Goomba. On the surface, Whack-a-Goomba isn’t all too awful of a Whack-a-Mole look-alike. Mario begins by standing in the middle of four warp pipes and has to jump on Goombas as they pop out of the pipes. Normal Goombas get you one point, golden Goombas get you three, and jumping on a Spikey loses you a point. Simple! I hate it! The big problem is that the 3D perspective isn’t good for this task. You pretty much have to decide on a main pipe you’re going to focus on and get the timing just right to jump on a Goomba and them bounce back to starting position. Often you’ll jump and land right on the Goomba, only to realize that the perspective is slightly off, so instead you land right above or right below and get no points at all. The Mole in charge of this game also won’t tell you the target score unless you ask him to explain the rules, so you have to ask him for the tutorial again just to know where to shoot for. And you HAVE to know where that score is. Don’t just shoot for a perfect score unless you want to ruin your chance of getting all the items here! You want to meet the target score exactly, and I mean EXACTLY, because the next target score is two points higher than your best score. The first time you beat the high score, you get a Flower Tab, then a Flower Jar, which are items that increase your maximum Flower Points (the points consumed to perform Special Attacks). I messed up here and pushed my score too high, so trying to hit the final target score of 28 was almost pure luck. All to then realize that every success past the first two just earns you a Frog Coin, a currency I don’t plan to use in this playthrough. UGH. Exiting the Pipe Vault puts us on Yo’ster Isle, the place where Yoshis live. Aesthetically it looks just like Super Mario World, which is a great throwback. There’s not a ton to do here though, which is a bit disappointing, but I still like to do everything the game has to offer, so I’m going to participate in the Mushroom Derby. To do that, I hop on our Yoshi (the green one) and challenge an extreme 90s blue Yoshi with sunglasses and a spike collar. This is Boshi, and he’s pretty cool. Fun fact, the Japanese version has him named Washi, which means “Bad Yoshi.” This makes Boshi the official Wario/Waluigi character for Yoshi. Sadly we never hear from him again since I easily beat him in a footrace and receive some Yoshi Cookies that I’ll never use because I just don’t use items in battle. With my diversion taken care of, I can get back to the main story, which leads us to Moleville. The town is bustling with news as two little kids named Dyna and Mite (because, I mean c’mon, this is a Mario game) have gotten trapped in the mines when a star fell out of the sky and caused a cave-in. The Moles get excited when Mario appears because he’s the exact person they need to solve the problem, though it does have a weird little tinge to the whole ordeal considering Mario’s sassier persona. Namely, if the third star wasn’t in the mines, would Mario and his party really bother at all? Sure, Mario begins his journey helping Mallow get a wallet back, but beyond that everything that Mario does is in pursuit of his main goal, which is to save Princess Toadstool and also find all seven of the stars to repair Star Road. Maybe that’s why Yo’ster Island is so weird to me since there is no reason for Mario to go there whatsoever except to kill some time. 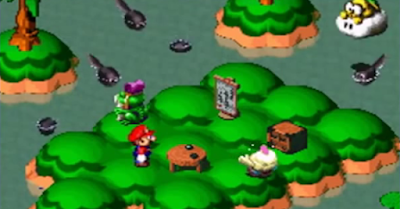 There’s also a little cutscene here that shows us Bowser’s plight and struggle to get his castle back. Mario’s party encountered him once before in Rose Way, stumbling upon a meeting where he’s gathering his squad of Goombas, Terrapins, and Magikoopas to go try and reclaim his keep, but here is where we really see how things are going. By Moleville, he’s down to three Goombas and three Magikoopas, accentuating that Smithy’s forces are that much stronger. Deep in the mines we find a Mole who’s reached a dead-end, wishing he had a bomb to blast the wall open. Searching deeper we find a trampoline just hanging out in the middle of the mines, waiting for a good bouncing. In a devious little trap, jumping on it slams you into the ceiling, causing Mario to black out. While unconscious, Croco and his thugs steal your coins and book it deeper into the mines. 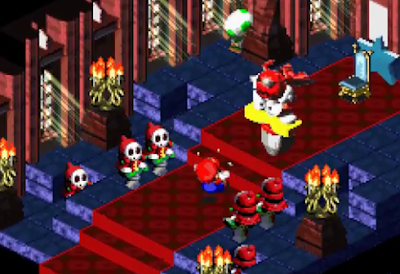 When I first played Super Mario RPG, there was a save file where a different kid had managed to at least get this far into the game, so I remember this segment distinctly, especially since it was the first portion of the game where I made actual progress on my own. Catching up to Croco sends you into a second fight with him where he eventually steals your items before getting properly thrashed and dropping a bomb that we’ll use to dig deeper into the mines. And that’s as far as I went today. Thanks to my diversion through the Pipe Vault and the unacceptably long attempts at Whack-a-Goomba, I’ve already hit the hour mark, meaning I’m saved right before the final boss of this area. Next time we go head-to-head with Nello...Punchinello.